When I think of desert trees, my first thoughts are Mesquite (Prosopis velutina) and Palo Verde (Parkinsonia spp.). As usual, upon closer examination of the local flora I’m sure to find many more types of trees. One genus that I’d like to highlight this month are the Oaks (Quercus species) that we find in Lower Sabino Canyon. 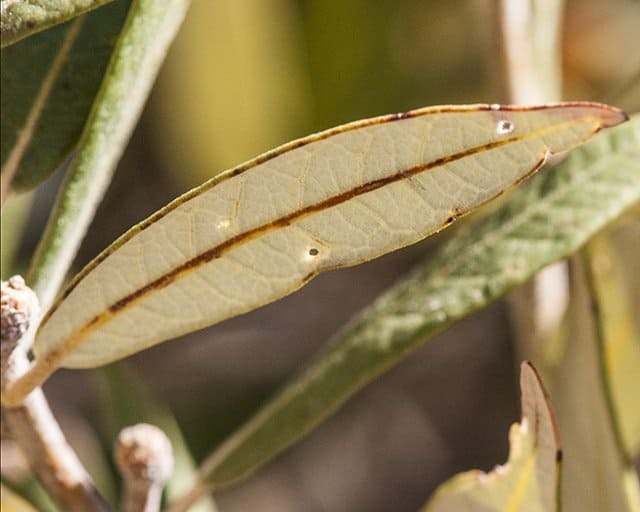 There are three species that I know of that have been documented in the Canyon and one more that I’ll address later in this article. 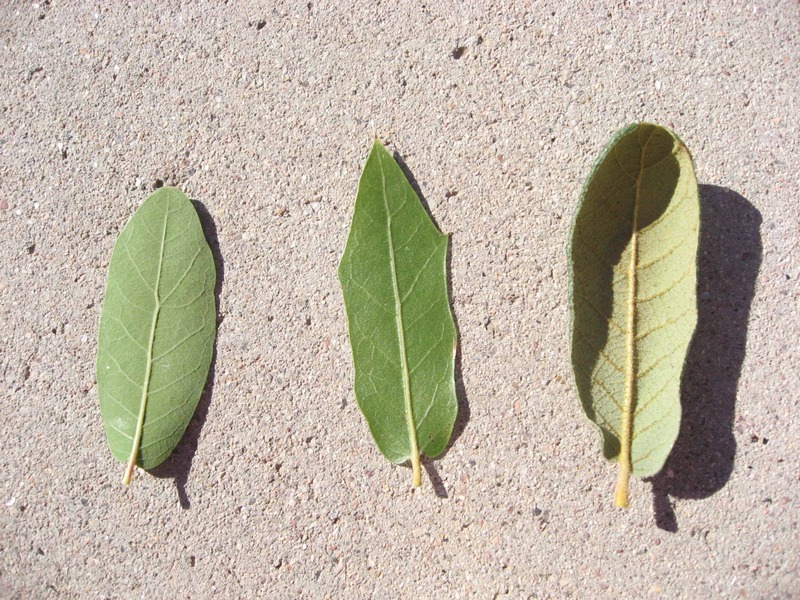 The three species are: Mexican Blue Oak (Quercus oblongifolia), Emory Oak (Quercus emoryi) and the recently found NetLeaf Oak (Quercus rugosa / syn. Quercus reticulata). These three oaks are ‘live’ oaks, meaning that they are not deciduous and do not lose all their leaves in winter. For identification, it’s always helpful to have fruit and flowers, but these oaks can also be easily differentiated from each other by their leaves alone. The Mexican Blue Oak is the one that is most common in Sabino Canyon. We see it along the tram road and along Sabino Creek. Emory Oaks are also found along the creek. 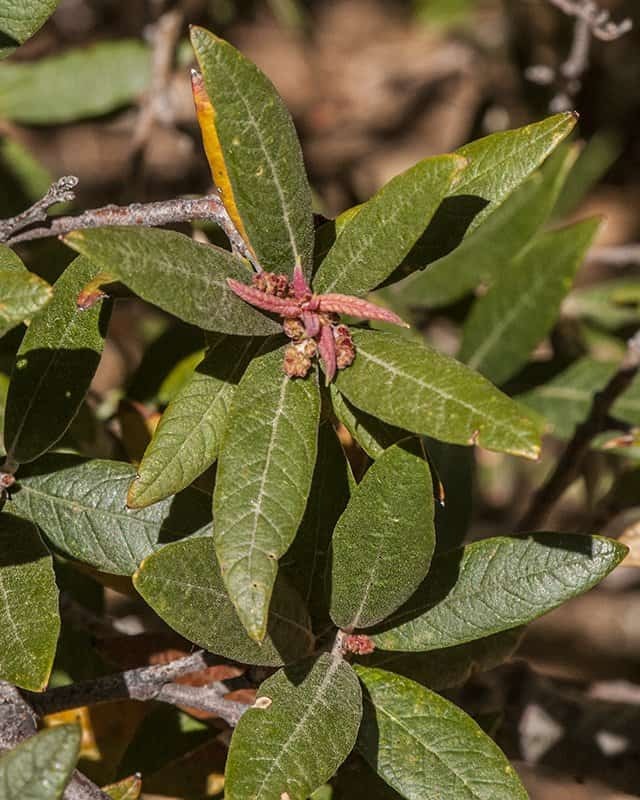 The Netleaf Oak is usually known from higher elevations and it was a surprise when one of our Naturalists (Fred Heath) discovered one growing in the creek bed north of the dam. Evidently this tree had been growing there for several years. I often speculate about plants showing up randomly in places where they are not usually found. I envision an acorn finding it’s way from the higher elevations during a flood or wet year and landing in just the right place to grow. I checked record specimens of Netleaf Oak in the herbarium at the University of Arizona. 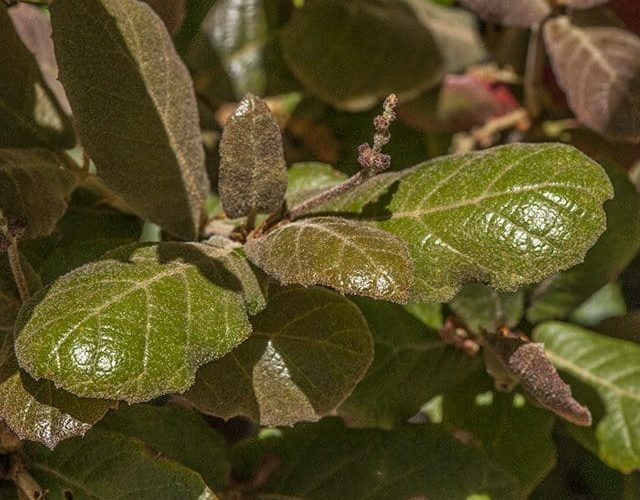 It seems that our Netleaf Oak is the only one documented at this low of an elevation (872 m) in the Tucson area. When I went to see the Netleaf Oak in Sabino Canyon, I also found the other two oaks, Mexican Blue and Emory within very close proximity. If you’re looking for something new and interesting to see, you can take a stroll to visit these beautiful trees. 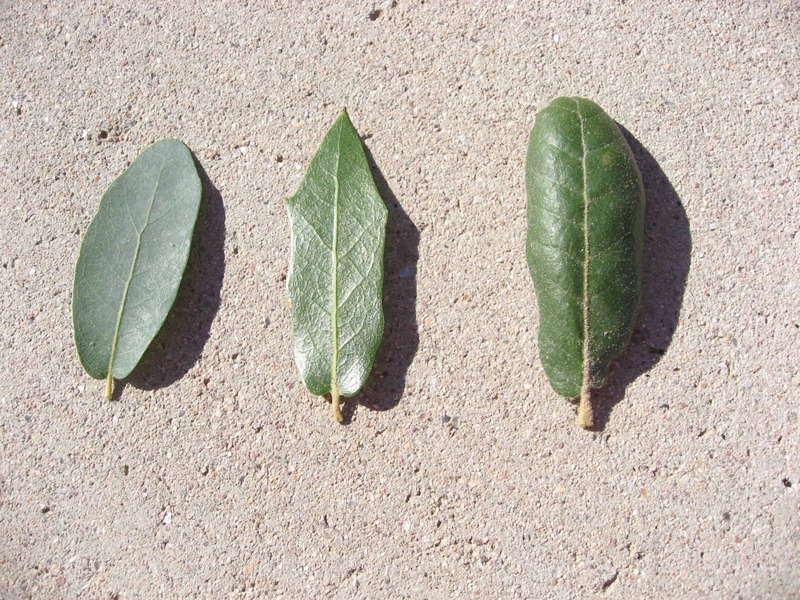 Check out the leaf characteristics and take note of the differences. I’m including some brief descriptions and picture comparisons. 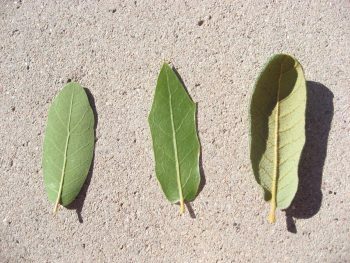 Here’s a description of each of the leaf types. I would also like to present an opportunity. 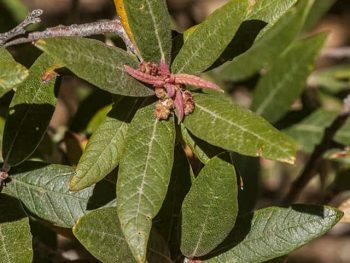 On our plant list for Sabino Canyon, maintained for many years by Joan Tedford, there is a listing for Silverleaf Oak (Quercus hypoleucoides). I have not seen this tree in Lower Sabino Canyon Recreation Area and do not have a documented record. I was hoping that maybe some of our hikers and patrollers might find one for me. I’m thinking perhaps enroute to Hutch’s Pool, upper reaches of Sabino Creek, or maybe Seven Falls. I’ve enclosed a photo of the Silverleaf Oak. 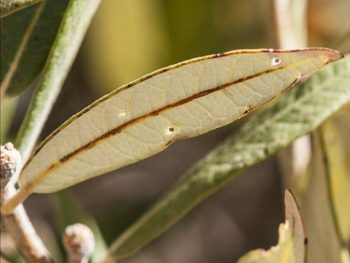 It is easily identifiable by the whitish undersides of the long, pointed leaves. Photos courtesy of Brian Gersten of SCVP. Check out his website for other Wildflower photos. (http://www.briangersten.com/wildflowers.html) If you do find the Silverleaf Oak, a GPS location and a photo will be helpful. The award will be your name included as co-collector on an herbarium specimen. If you’re interested in finding the Netleaf Oak, here’s the GPS location: 32.32078 -110.80961 , elevation 841 meters/2759 feet. Follow the creek trail to get there and you can also find Mexican Blue and Emory Oaks, an Alligator Juniper (Juniperus deppeana), and on a nearby Ash (Fraxinus velutina) is an eye-level specimen of Big Leaf Mistletoe (Phoradendron serotinum ssp. macrophyllum). I’m always amazed at what I can find if I just take the time to stop and look.